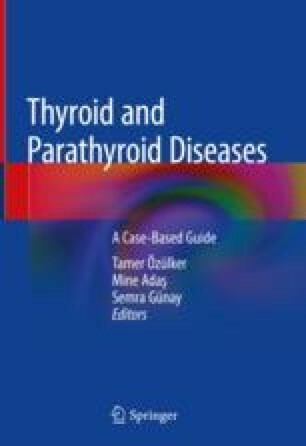 The widespread use of imaging modalities such as ultrasonography (USG), magnetic resonance imaging (MRI), and computer tomography (CT) has significantly increased thyroid nodule detection. Thyroid nodules are generally benign, but identification of malignant nodules is an important clinical problem. Nodules with hyperfunction on thyroid scintigraphy, also known as autonomously functioning thyroid nodules (AFTNs), are often considered as benign. The American Thyroid Association (ATA) Guideline, revised in 2015, recommends thyroid scintigraphy only in conditions with subnormal TSH values. On the contrary, the American Association of Clinical Endocrinologists, American College of Endocrinology, and Associazione Medici Endocrinologi Medical (AACE/ACE/AME) guidelines recommend to perform thyroid scan in iodine-deficient regions, to exclude an autonomous thyroid nodule or MNG even when the TSH level is low-normal. Especially in areas with iodine deficiency, it has been shown that AFTNs can be seen with the TSH values in the normal range. As in the cases from Turkey, an iodine deficiency area, AFTNs are detected, although TSH values are monitored in the normal range. Avoiding from thyroid scintigraphy in cases with normal TSH values in the direction of ATA guideline can cause some AFTNs to be missed. The unnecessary biopsies resulting from indeterminate reports like AUS and FLUS can lead to unnecessary operations. For these reasons, thyroid scintigraphy has an important role in the detection of AFTN, especially in iodine deficiency areas.